When all this blogging began, I wrote at two different addresses. I took over for Tom on Wiggles, where he had written and then I continued writing about our kids, and I started A Midwestern Girl in Cowboy Country, where I wrote about adjusting to - and eventually learning to love - life in Texas. After a few years A Midwestern Girl received an update/upgrade and Chasing Roots was born. I continued to maintain both blogs for a bit longer, but eventually decided that doing so took more time and energy than I had to give so I combined the two, trying to blend what I wrote about my kids with what I wrote about the Lone Star State, all at Chasing Roots. I write because I want to document life, to preserve our stories and my memories. An added bonus was that throughout the years, family members, friends, acquaintances, and then even strangers began to read Chasing Roots. Thanks to both Facebook and the statistics feature of the blog-publishing platform I use, I could see the likes, shares, and page views increase, and while these numbers were not why I started writing in the first place or continued writing year after year, they did make me feel good about reaching readers. My hope was and will always be that everyone who visits Chasing Roots finds something they need: an emotional pick-me-up, a mental reset, an authentic laugh, reassurance, or in the case of my and Tom's parents, pictures of grandchildren. I knew that Facebook posts - on my personal page and the Chasing Roots page - drove a great deal of my blog traffic. I didn't realize how much, however, until about a month ago, when Facebook changed their algorithm and overnight my page views dropped by hundreds a day. I wish I could say the decrease didn't impact me, that because I write for myself I didn't take the sudden downturn personally...but it did, and I did. And I feel guilty about it. I have steered clear of expanding Chasing Roots on social media platforms other than Facebook because, quite frankly, I don't like other social media platforms. I use Facebook because, at least when I started writing, it was the most efficient way to disseminate blog post links. But beyond those Facebook shares, I wanted my to writing to stand on its own and do the work for me. I wanted to draw in readers with my voice, my style, and my content. I wanted the blog to grow organically enough that I wouldn't have to use Instagram and twitter and Pinterest to "drum up business". But I've come to realize - to accept, more accurately - that that isn't the world we live in anymore. Generally speaking, blog posts are too long and our attention spans are too short. We no longer follow our favorite blogs or bookmark blog posts we want to read later. In this 140-character world, we skim past anything that requires more than a one-minute commitment. Even as a blogger, I am occasionally guilty of this myself. I have followed the blog Young House Love for years. The couple who created the blog expanded their social media presence to include Facebook, Instagram, Pinterest, and Twitter (they also have a podcast, two books, and decor and furniture lines), but they still write beautiful blogs posts. Last weekend they posted on Instagram these comments, which ultimately sum up what bloggers are dealing with now. And if they're struggling - with their well-known brand - you can only imagine how those of us with tiny little blogs are doing. I've also come to realize - to accept, more accurately - that maybe Chasing Roots doesn't have the staying power I wanted it to have. Maybe my writing can't stand on its own and do the work for me. Maybe I can't draw readers in with my voice, my style, and my content. 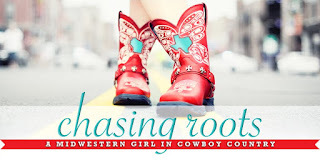 I don't blame readers for not visiting Chasing Roots without the Facebook reminder, I don't blame Facebook for changing their algorithm in a way that negatively affects my blog, and I'm definitely not throwing myself a pity party. I'm just reflecting on how I should have, years ago, diversified my social media presence and created a stronger brand. The challenge here lies in the fact that Chasing Roots is my resume, and not my job. At most, I make pennies on each post. (I often joke that Chasing Roots brings in just enough for me to buy one Starbucks drink a month.) This doesn't bother me though, because 1) the blog is how I document life and preserve our stories and my memories, and 2) the blog is where I direct potential employers when they ask to see samples of my writing. That said, I spend a significant amount of time working on the blog. When I could see the page views climbing and the shares increasing, I knew the time I spent on the blog was worthwhile because my resume was getting the exposure I needed. But now that the page views have dropped dramatically, I need to rethink how I allocate my time. I find myself at a fork in the road. I could continue on as if nothing has changed, writing three regular blog posts a week and sharing links to these posts on my personal and the Chasing Roots Facebook pages. I could "speed up", expanding Chasing Roots' presence on social media, adding Instagram and perhaps Pinterest into the mix, and/or paying to advertise or "boost" my posts on Facebook. Or I could "slow down", decreasing the number of posts or even stepping away from Chasing Roots completely. At this point, none of these options feel quite right. So for now, I've decided I want - I need - to continue writing here at Chasing Roots. I can't give it up, but I need to step back slightly. I need to figure out how much time I should dedicate to this space. I need to figure out if I can - and should - grow my social media presence. I need to figure out if I'm willing to designate some of the money I make on other writing projects to expanding this one. While I do so and through the end of the year, I'll post a little less frequently, probably twice a week on Tuesdays and Fridays. When I have a better idea of where all this is going, you'll be the first to know. Thank you for journeying with me thus far, and please stick around. For fun, here's a link to my very first blog post, four-and-a-half years and nearly 1,500 posts ago.